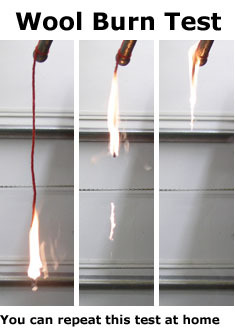 New National Flameproof Mattress Regulation Requires Acutely Toxic and Cancer Causing Chemicals in all new mattresses. July 1 2007 was compliance deadline for all mattresses nationwide. Fortunately we have ways to offer you toxin free mattresses including: Doctors including Chiropractors can prescribe toxin free beds under the new law. We can arrange the prescription for you if needed. And, the prescription saves you the sales tax on the mattress set purchase, and it may also be deductible on your income taxes. Buy direct from Manufacturer, our Dealers, or Chiropractor Dealers, Call 800-456-6442 or click here for a dealer near you. They can custom fit you a mattress that provides Proven Best Back Support, 90% Less Tossing and Turning, and Clinically Proven Better Sleep, with our Patented "Lever Support System." Plus you know you are getting a toxin-free bed. "Many manufacturers are predicting a backlash once consumers start to investigate what's really lying under their sheets with them." "Mattress factory workers are coming forward and admitting they are getting sick simply handling the new chemically-laden materials"
All mattress makers will claim they use no chemicals, but the CPSC documents prove otherwise. Click here to see the CPSC table of chemicals used, and here to see their table of the amount of poisons absorbed daily from flameproof mattresses. 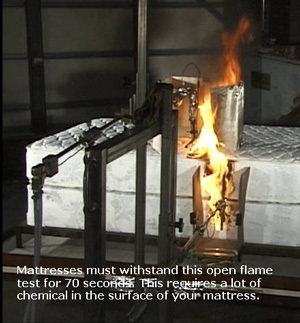 Recently, Boric Acid (yes, the Roach Killer), Antimony Trioxide, Silicon, Melamine, Formaldehyde, Decabromodiphenyl Oxide, and Ammonium Polyphosphate are the main chemicals being used by mattress manufacturers to meet state and federal flammability standards. The CPSC has proven these chemicals leach to the surface of our mattresses and are absorbed by our bodies. They have proven we will absorb .8 mg of Antimony, and .08 mg of Boric Acid every day. We know Antimony accumulates in our bodies, is acutely toxic, and also causes cancer. There can be as much or more than 1.5 pounds of these chemicals in the surface of a queen mattress. There are huge health risks from full body contact and breathing these chemicals eight hours a day for the rest of our lives. Our science warns us many of these chemicals are regarded as a carcinogen. Others are known to be a reproductive and developmental toxin: High prenatal mortality, birth defects, reduced fertility, sterility. Liver, kidney, brain, and heart muscle damage are other effects. Plus much more! The consumer products safety commission hopes to save one out of one million people with this law. People with allergies, asthma, preexisting conditions, and other special populations, are probably at even greater risk. Learn more about the risks by clicking here. Protect Yourself – with your doctor's prescription you can buy a mattresses free from flame retardant chemicals. Fortunately, the law allows “a physician, chiropractor, or osteopath licensed or otherwise permitted to practice by any State of the United States,” to prescribe a special mattress free of these chemicals to a named individual. Order online, by phone, or through our dealers, but before we can ship we must by law have a written prescription to a named individual on file. Simply have your doctor fax your prescription to 812-282-6528, or we can arrange a prescription through your doctor or another doctor. Our New Patented “Lever Support System” is a technological breakthrough unmatched in the mattress industry. The Lever-Support System works like a teeter-totter, when larger parts of your body depress one end of the Levers, the other ends actually push up, to support recessed areas such as the small of the back. Combine the Levers with our Polyfilax Elastic Polymer surface and you have the most perfect bed invented to date. Dr. Brian Anseeuw, DC, MD “The patented design for equal support incorporated with space age polymers, gives comfort not seen in any other mattress. Dr. Richard W. Powell, MD “The Strobel Supple-Pedic Mattress is improving sleep quantity and depth reducing pain and increasing quality of life. Dr. John A. Wisman, DC “The support this system provides is critical to better health.